But it doesn’t all have to be tossed in the trash. There are ways to cleverly recycle diabetes supplies. And since Earth Day is this weekend, we’re looking at ways to reduce, reuse, and recycle our diabetes trash in ways that go a little greener. We can always reducethe trash we’re generating, if we are consciously working at it. Buying low blood sugar treatments in bulk and then breaking them down into properly pre-portioned travel sizesin reusable containers is one way to reduce waste. But reducing can be challenging when it comes to the medical supplies that are necessary to diabetes management. Which is why recyclingis awesome. You can definitely recycle the boxes that your insulin comes in, along with gobs of paperwork that comes shoved inside each box. Same goes for boxes of test strips, or CGM receivers, or pump supplies – these can all be broken down and tossed into the cardboard recycling bin. Check the boxes for the recycling symbol so you know which items are ready for recycling. While certain electronic items can be recycled, finding the right place to drop off your old Dexcom receivers or other devices can be tricky. Check out Earth911.com to search for the proper drop-off spot for your techy bits (and to help declutter your bathroom cabinet museum of moldy old diabetes devices). When it comes to reusing diabetes supplies, the art world knows how to make diabetes trash into treasure. The art created on Diabetes Art Day has been nothing short of amazing. (Check out this article from Diabetic Living that features some of that art!) And this article lists several diabetes art projectsthat you can create on your own, like a diabetes robot or a superhero comic book. Test strips themselves can be a versatile medium, allowing artists to create portraits with used test strips. Even the jewelry artists think upcycling has a nice “ring” to it; evidence found in this amazing test strip ringcreated by a talented T1D. And if you’re looking for some spangly-dangly diabetes to grace your ears with, check out these earrings made from insulin pump supplies(also comes with instructions on how to make your own). Are you an insulin bottle hoader? 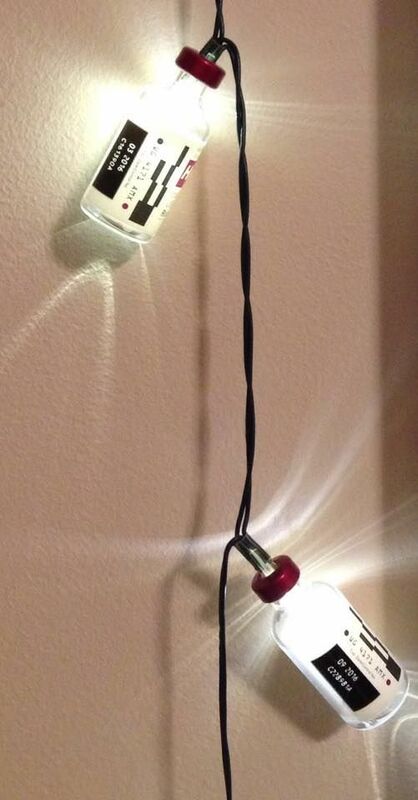 You can take those empty bottles of Humalog or Fiaspand make your own insulin bottle lights! Some careful assembly required for this conversation starter, but the end result is enlightening. When it comes to the things we can’t recycle or reuse, properly disposing of used sharps (pen needles, lancets, syringes, etc), is important to make sure you’re responsibly managing that waste. Check out SafeNeedleDisposal.orgto see how and where sharps can be disposed of in your town. Oh, and today would also be a great day to remember to turn off the lights when you leave a room, and to make sure you aren’t leaving the faucet running while you brush your teeth. Because it’s not just your diabetes that needs a little love here and there. The Earth could use a hug these days, too. 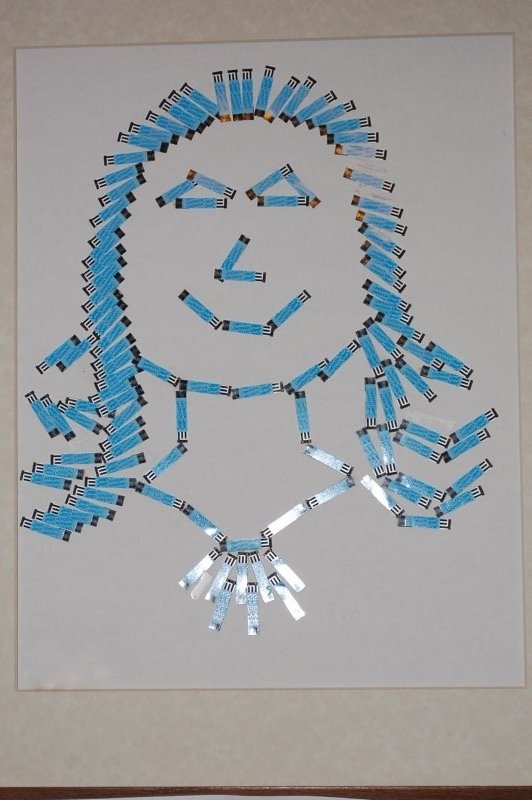 Do you have more examples of art with old diabetes supplies? Perhaps we could get the JDRF involved collecting recycled supplies for children to create art with? with pump infusion sets like the mio/ insite you can use pliers to remove the needle and the rest (all the plastic) is recyclable!